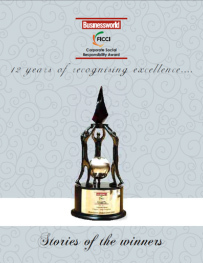 FICCI has been encouraging and facilitating businesses to adopt CSR practices by recognizing and honoring exemplary CSR initiatives of various companies through FICCI CSR award. This book is a compilation of case stories of 7 winners of FICCI CSR award showcasing the positive difference they have created through CSR. The book chronicles the quintessential case stories of Smaat Aqua technologies Pvt. Ltd, tata Steel, MSPL Ltd, Elin Appliances Pvt. Ltd, MCX, Jaipur Rugs, Bharti Enterprises, who have made a mark in promotion of Inclusive development of the society. The book was launched at the 12th FICCI CSR Awards on December 7, 2012.